Explorer Bag is a California-based company that researches, develops, designs, and manufactures high-quality tactical gun cases, rifle bags, range bags, and backpacks. Explorer has been making gear to store and transport firearms since 1994. 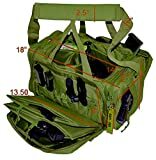 The Explorer Range Bag is a mid-level, economically priced range bag designed to hold necessary range or duty items while remaining compact enough to be used in the field, on duty, or stashed as a “go bag.” Explorer says they designed this bag with law enforcement or tactical operators in mind. The Explorer Range Bag measures 16” x 9” x 11”, or 1584 cubic inches. The bag’s size is adequate for carrying two, extra magazines, accessories, and plenty of ammo for a day at the range. The main compartment dimensions of 13.5” x 7” x 9” comprise 850 cubic inches or just over half the total volume of the bag. The main compartment holds two handguns in specially designed dedicated firearms pouches. The pouches protect your guns and are perfect for checking in at the range, whenever you visit a cold range. The Explorer Range Bag is 100% 1200D ballistic nylon, which is significantly stronger than the 1000D ballistic nylon typically used in similar bags. The pockets and compartments have padding to keep the contents of your range bag safe during hard use. The Range Bag is a high-quality, rugged range bag with thick fabric, heavy-duty stitching, and a tough look and feel. This bag comes in six colors to suit a wide variety of tastes, preferences, and department regulations. Some users reported that they appreciated the plain, unremarkable exterior of the bag. A range bag without overt gun logos or references is easily mistaken for a regular gym or duffle bag, which is why users who have concerns over privacy prefer this design. We like the bag’s configuration of a large main compartment with lots of smaller pockets and pouches to keep various items tidy and separate. The magazine pouches are very deep, and there is plenty of room for your pistols plus a few hundred rounds of ammo. The main compartment features two dividers, a fast access double zipper with roll-up flap, and locking zippers. The dividers allow users to create two or three custom-size compartments, and the double zipper will enable users to access the main compartment with one hand quickly. The locking zippers may meet legal requirement firearms transportation in some states (be sure to check your state’s laws). The bag’s padded shoulder strap is more than capable of transporting the bag comfortably, even when fully loaded. If you don’t need it, you can easily remove the carry strap and carry the bag by its handle. Explorer offers buyers a lifetime warranty with no questions asked, which is our favorite kind of warranty. They will refund every penny if you don’t love it for any reason. A lifetime warranty adds immense value to a range bag, especially for customers who put a lot of wear and tear on their gear. The Explorer Range Bag is the #5 choice in our list of best range bags. Compared to other bags we’ve reviewed, at 1584 cubic inches, the Explorer Range Bag is at the smaller end of the spectrum. Depending on your needs, it might be too small, or it might be just the right size. If you typically bring one to two guns to the range, we think the Range Bag is probably big enough to carry all the ammo and accessories you’ll need for a full day of shooting. Some users reported quality control issues, like a tear in the quick-access flap, sticky zippers, or a buckle that wouldn’t stay buckled. Unfortunately, this happens with many different manufacturers, at all price ranges. The good news is that Explorer’s lifetime warranty covers any issues you may encounter, whether they originate from poor QC or wear and tear. The most common criticism of the bag was that users desired more pistol pouches. While there is room to add aftermarket pistol pouches, a third and maybe a fourth removable pouch is worth considering for Explorer. However, some people have reported that they were able to fit their handguns in the outer pouches of the range bag. The Explorer Range Bag is Maximo B.’s first range bag, and he’s happy with it. He uses it to transport two handguns, two pairs of ear protection, glasses, ammo, and tools to the range. Wu G. says the bag exceeded his expectations when he received it. The material and stitching are high quality, and the bag is durable. He likes the padding of the bag to keep his guns and accessories protected, and would recommend the bag to anyone looking for a high-quality range bag on a budget. Grady P. says the bag easily holds his two pistols, eye protection, ear protection, tape, target stickers, and LOTS of ammo. He says the bag is a winner, and he appreciates that it looks like a typical weekend bag, so he doesn’t scare the neighbors. The Explorer Range Bag is well-organized, modular, rugged, and a great value. If you are transporting two pistols for a day at the range, this bag has more than enough room for ammo and essential accessories. If you don’t need a larger bag and don’t want to spend double or triple for a high-end range bag, we think the Explorer will suit your needs. √ EXPLORER RANGE BAG IS DURABLE: Constructed of 1200D ballistic nylon AND Heavy Duty Zippers and Pulls. Most other brand are 600D. Only Explorer have 1200D! Which is double strong! √ EXPLORER RANGE BAG IS LIFETIME WARRANTY. If for whatever reason you don't absolutely love your new range bag, just return it, and we'll refund every penny.